NWHikes - What trail will you take? We are in a perpetual process of gathering hike information for trails throughout the Pacific Northwest including: Washington, Oregon, British Columbia, Idaho, Alaska, and Montana. So far, we have collected trail information for hikes in Washington, Oregon, and a couple in British Columbia. As of yet, there is not complete hike details for all hikes that are listed. Keep checking back as you'll see more information added to Northwest Hikes. Also, in the near future, we'll be asking you for your favorite hikes that we've missed. Our goal is to have a single home on the web that has hiking information for the entire region. "What trail will you take?" After a long adventure, the search functionality has returned. It was present in a previous iteration of the site but never made it in the move to the new format a while back. It has been a feature that folks have been asking for. Finally put back. 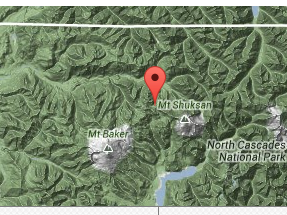 Ever since I started this site, I wanted to get maps to show with the details of the hike. Finally, this has come to be! There are still some hikes that do not have map information but the list is shrinking. Those hikes that don't have the correct information yet show a map to Mount Rainier. One more step ticked off the list of things to add or put back. This site has been around for a number of years. While hiking information has been routinely added, the site layout and design had become quite stale. NWHikes is pleased to present a new redesigned modern site for you to access your hiking information. The site is better designed to be able to work with varying sized screens and works better than before with smart phones. If you have thoughts and ideas for improvements, please contact us. Enjoy! The weather forecasters are predicting a hot spell in the Pacific Northwest. Be prepared for the heat when hitting the trails. Bring plenty of water and/or a water filtration system. Be mindful of the heat-related warning signs, and find ways to stay cool. Unknown NWHikes does not yet have difficulty level information for this hike. Accessible Usable trail by all skill levels and hardly, if any, challenges will be encountered. Often paved or board-walked and mostly level trails. Easy Use of the trail requires limited skill and few challenges will be encountered. Moderate Use of the trail requires some skill and will experience more challenging terrain. Difficult Use of the trail will require a high degree of skill and challenging travel will be encountered. More Difficult Use of the trail will require a higher degree of skill and more challenging travel will be encountered. Strenuous Use of the trail requires great effort. A high degree of skill will be required and many challenges encountered. Whenever anyone hits the trail, there are ten essentials that they should always have with them. You may have not thought to include these items with you when you take a hike, but they should become staples in any pack you take with you when you go hiking. We are all very fortunate that we have the trails that we do have. Many people have devoted countless hours from working with legislators to protect wild areas, to being a part of work details who build and maintain trails. We all have a responsibility with this to make sure these trails are available and usable for generations to come. The Leave No Trace principles will help to ensure that happens. Copyright © 2000- MSWhite. All rights reserved.